Hi, hope someone can help, I've currently got the EML light on. A quick scan on a cheap vw reader shows 02547 Motor for Intake Manifold Flap (V157), Malfunction. Value of resistance too great. Last edited by oktember; 26-12-18 at 19:36. 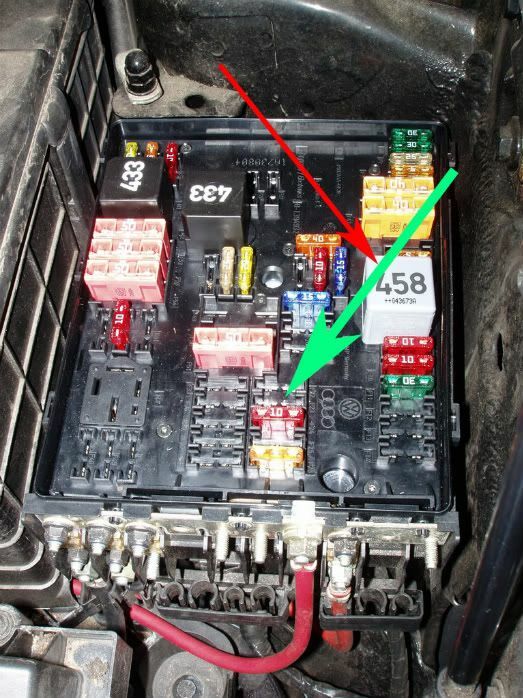 Check fuse 8 in the engine bay fuse box. Thanks Crasher, F8 - 15amp ? appears fine. Thanks Keith, No I dont, but I only have Gmail ? Any Idea as to why the EML Light is ON When the car drives/accelerates/shuts down ~ No Run On ? or should I just Replace the IMF Again?? Thanks again Crasher, I've 'pm'd reg number. Fuse 24 on that version BUT if it is blown you should still get a fan controller fault code so your fault code reader may only shown OBDII emissions codes and the fan isn't one. If this 10 amp fuse is definitely not blown then look down behind the radiator behind the left hand side headlight and you will see a black 14 pin multiplug, I am seeing an increasing number of Golf 5's with corrosion damage in this plug, you are interested in the blue/red wire at pin 6 which should show 12v ignition live and continuity back to the output side of fuse 24. Also on the post June 2007 cars (yours is 07-09-2007) there is a modification to the wiring supply to this pin buried inside the harness where the wire went down 50% in size from 1mm CSA to 0.5mm CSA at a welded junction, these can corroded but finding the join will take a huge amount of work.